The ADA Concealed Latch Fix It Kit with Indicator is a GREAT solution. The One of the problems we run into out in the field are broken bathroom stall concealed latches. You know the ones where the 3/8″ diameter pin comes out of the edge of the door. These handles are hard to fix or replace with new handles unless you know the manufacture, or you have the old latch and it has a number on. 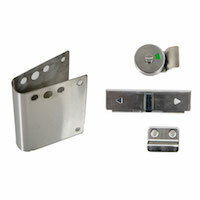 We have just started stocking a ADA Concealed Latch Fix It Kit with Indicator . With this new Kit on your door you will meet ADA Specifications, and hopefully keep patrons from walking in on other patrons. The kit includes: ADA Stainless Steel Slide Bolt Latch with Indicator,Keeper, Stainless Steel “U” Shape cover for both sides of door, and all Screws Included. Manufactures part number is 126629.